Our bestselling Multipurpose WordPress theme with a clean-looking design created for corporate and portfolio websites. 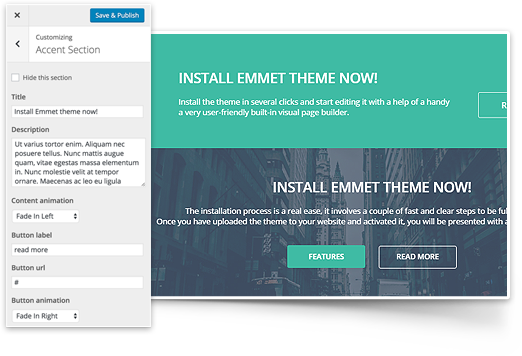 Emmet comes packaged with a premium WordPress Page Builder plugin and is fully integrated with WordPress Customizer. Full control over the front page sections. Fill any content block with your texts, update links and graphics in any content block. This customization process is performed visually via the WordPress Customizer and doesn’t require technical expertise. Your content automatically adapts to any screen size and looks great on all devices. Your text is readable without additional scrolling, the images look sharp and navigation is smooth, providing satisfying user experience for every website visitor. All content elements can be easily enlarged and previewed in close-up details. Get more freedom for the front page customization. You can easily change the positions of any content block or entirely hide the unneeded ones. All the tweaks are made visually via WordPress Customizer requring no technical help. 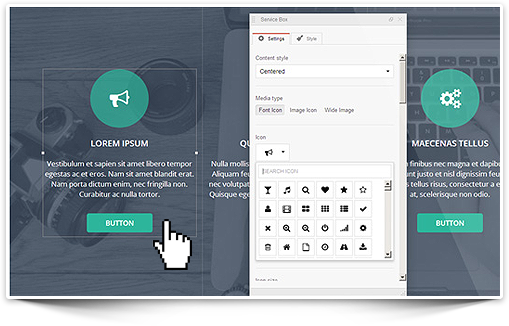 This WordPress Visual Builder is a feature-rich website frontend builder that works on intuitive drag-and-drop functionality and is supplied with numerous necessary built-in content elements. It’s much handier than default WordPress editor as it will help you build a multifunctional website totally visually. Personalize your site with favourite or brand colors. Simply choose from 4 predefined color schemes with complementary colors or apply your own ones using color picker. You may update the color of header text, background, website text, accent (typically used for titles and calls-to-action), accent hover, and sub-menu hover to make your site really colorful and unique. The theme offers a full range of in-demand content blocks to properly establish your online presence. You can display your projects in Portfolio section, present offerings in Pricing tables, introduce the stuff in a Team section, put Newsletter form, edit Testimonials section, set Contact form, and adjust Google map to show you location. This feature makes it easy for you to extend the possibilities of your site in terms of usability and functionality. Easily handle interaction activities with bbPress, create online store installing WooCommerce, or add any other content element with MotoPress drag-and-drop WordPress editor. Works perfectly with WordPress Slider by MotoPress. 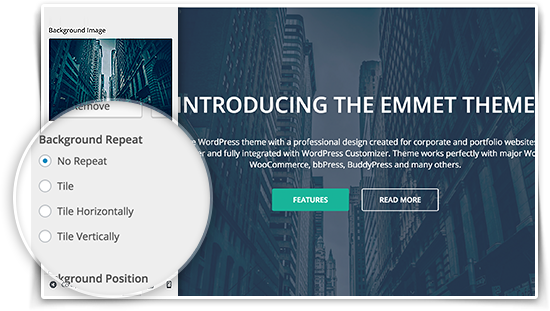 Emmet theme includes both classic and masonry blog layouts. Depending on your content and requirements, it’s easy to place all content elements in the best optimal position using any of 4available blog layouts: masonry, with sidebar, full-width, or two columns. 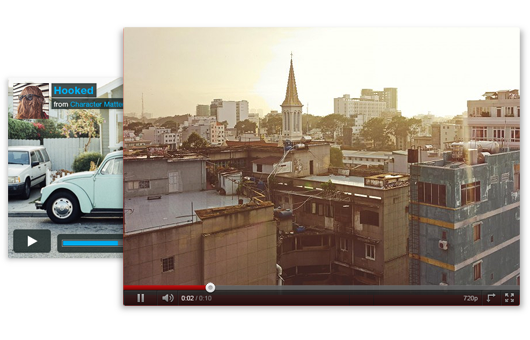 Make the header of your site more trendy and informative with a background video. Simply go to Big title section in the WordPress Customizer and replace a default image with a dynamic video to catch visitors’ attention and keep them interested right after landing on the front page. Add as many Feature blocks as needed to let the site visitors immediately understand your values. Each feature is displayed in its individual block under Features Block sections similarly to ‘WordPress Customizer. You have a full freedom to put any type of information within these sections. I absolutely love the theme, the easy way to tweak it and over all the great support team. They really do more than they need to do. Great work, great Team. With several plugins and have no issues. 1. Can I align the top menu to the right instead of the left? 2. If I want to remove the side bar in the product page, should I use Editor to edit the coding or add Products to new page manually via the WooCommerce integration with Page Builder? 1. Yes, you can do that with custom CSS styles that can be applied to Appearance>Customize>Additional CSS or style.css file of the Child Theme. You can order Extended Support offer in case you need our assistance in customizing theme. Suggestion – Can we have an option of an image in the call to action section with a choice pf position? Thanks. As there is used single background image throughout all the sections of the front page you can define position for all the sections and not for each one separately. I bought the pro version and after I installed it the home page looks nothing like the Demo. I see the ability to edit the different modules that are in the Demo in the admin panel but the actual home page I see looks completely different. Is there something I need to do to enable that view? We’d recommend to go to Appearance>Theme Wizard and follow the steps described there. Or you can email us and we’ll assist you with it. Is it possible to add extra feature sections or are you limited to the number provided by default? You can add more Feature sections by adding Theme-Feature Block widget to Features Block Section widget area. Thus you can add unlimited amount of Feature Block widget to this widget area. Hi, guys, how do I add other socials link from font-awesome? You can leave your feedback and specify what social network you’d like to add and we’ll try to fulfill this in one of our next releases or suggest an alternate solution. I purchased the Pro version mainly to get rid of “The company with over 5 years experience of delivering best consulting services for personal and business needs.” in the footer and it seems I cannot remove it. When I hover over it I am prompted to shift click to edit it and that does not work at all. The only thing I can do to be rid of this is remove the ENTIRE footer. Could you please tell me how to eliminate this annoying irrelevant widget text from my footer. You can change this text through Appearance > Customize > Widgets > Footer Left > Add a Widget > Theme – About us and fill in your own info, substitute this with any other widget or leave blank. You can also contact our support team if you need any assistance with the theme settings. Can you add a “Meetup” social link please? We’ll try to add it in the next update release. Thank you. Quick question re the shop – Is there a way I can show some “featured” products on the home page of a site that uses Emmet? I like the way the home page is structured and updated in wp-admin, but there is no option for Shop items…..Is there a way of adding them please? You can try adding it using shortcode or WooCommerce widget to any section you do not use. We’ll also review this request and will keep it in mind for further theme updates. Thank you. Just bought Emmet Pro as it says no technical expertise needed. Now struggle: Why doesn’t Visual builder work on landing page? I want to do the 3 boxes with my services in the first feature section. You can edit footer text by going to Appearance>Customize>General. Just to clarify, that means I can only use the widgets for my front page. I cannot add the feature “service box” from visual builder into any of the widgets? And the Visual Builder that comes up when I open my front page is not actually working. Why is it then there? 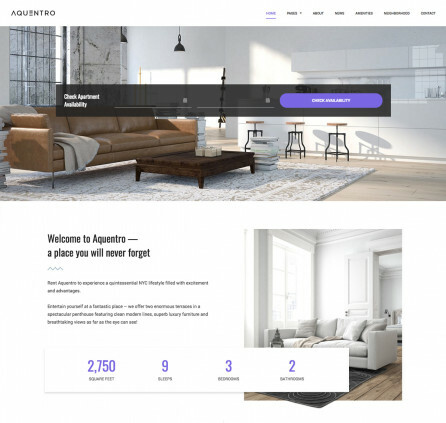 I bought this theme as it says no technical expertise needed and to have the ability to make the pages you have in your demo. I can’t see that it states that the front page is not adjustable. You do not need any technical skills to edit the Front Page. It is the main feature of the theme when you can manage sections via Appearance>Customize. 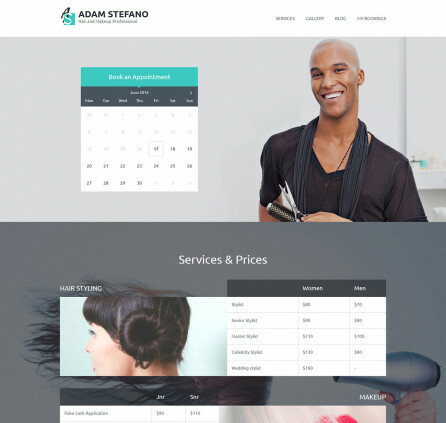 This layout appears with page template called ‘Customizable Front Page’ and it can not be edited with Visual Builder. This layout is applied to Front Page by default. All other page templates can be edited using Visual Builder plugin. Thus if you want to create a Front Page using Visual Builder plugin you need to switch to another page template e.g Full Width or Landing Page. Please email us if you need further assistance and we’ll guide you through this setup. Social links only showing up on random pages any ideas please? Yes, you can use Emmet Lite for commercial projects as well as Premium version. But there are not available some premium features and is used lite version of MotoPress Page Builder. 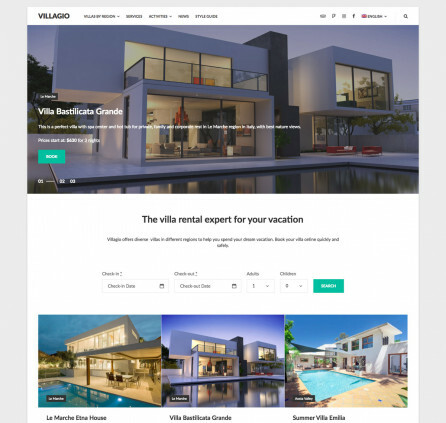 Yes, the theme is WPML compatible but you will need String Translation module additionally to translate Front Page as it is built with widget areas and custom blocks. Can you advise how I change the colour & opacity of the overlay in the main image section on the home page please? I need a header image, where the Sidename stands, is that possible in Pro ?. I already own your Visual Builder Pro version, is there a discount purchasing the template ? Thank you for kind words and for your interest. – There is available page template that is called ‘With Header Image‘ It shows Page title and header image. – There is 25% discount available now at our website. So you can hurry up. – Unfortunately we did not have chance to use ‘duplicator’ so we can not advise you. We recommend to move WordPress by uploading files. and importing database. Wow, thats quick. Thank you. I checked the header Image template, but then I’ll loose all the sections Design, is that right ? And the last question – i purchased the Pro Version now. I saw in this comments, when I install Pro, all the Front Page Setting will get lost. Any way to avoid this ? Installing child theme first, or something similar ? The Sections layout is provided by page template called ‘Customizable Front Page’. Do you want to have a header image with page title at Front Page? You can use Big Tittle Section then. Yes, the page template of the Front page is built from custom areas mostly and when the theme folder name is changed you need to re-setup the texts and other stuff. The widgets might remain but some information might be needed to add again. This happens even if you install Child Theme. So we recommend to install Child Theme right after theme installation if you are sure you will edit theme files in future. Hello, I’m having trouble activating the Emmet Theme Engine plugin. “The plugin could not be activated because it caused a fatal error. Most likely you need to update PHP version at your server. You can try to contact your hosting provider and ask them to upgrade it to 5.3+ version. I’ve checked your website and it seems to run properly. Actually you can ask questions like this at our forum or by email. Thank you. We publish our site at the correct address and now displaying the same error. 1. Try to upload all files via FTP in binary mode. Hello, i have problems to enable the comments on this theme. I use Emmet lite and can`t find a solution for this. You can check WordPress Settings>Discussion or check Screen Options at any post and enable Discussions. If you mean comments at page so it is not available by default. You can add comments block using Child theme. Yes, It`s about page comments. What do you mean with Child Theme? In this moment i use free version Emmet lite installed by wordpress. If you need our assistance you can get Pro version of theme or order Extended Support Offer. If I buy Emmet pro theme (55$), can I have a source file of this theme? PSD files are not included into theme package. Or you mean other source files? I mean setup files of this theme. so Can I install this theme to my server? I’m interested in this theme!! I’m wondering does the theme allow to move the layout sorting? If I’d like to move “features section” to the top, before the “first feature section”, is it possible? Thank you for your question. Yes, There is Section Position value available at each Section in Customizer. You can change order of the sections at the Front Page by editing Section Position value. I have installed Emmet-Lite to test out the theme and am really happy with it so I will be upgrading to the Pro version, once I pay for this and download and install the theme will I need to redo all the settings, customisations that I have setup in the Lite version? Thank you for kind words. After installing Pro version you would need to re-build Front Page only as theme folder differs. We would also recommend to install Child Theme for Pro version right with Parent theme installation if you are going to modify theme files. We are happy you liked Emmet theme. Feel free to check out other products also available at our website! Am in the middle of creating my site, everything seemed okay until I added Member login form from Ultimate Member Plugin… The page has some content now not displaying – my products section, my portfolio and a few others, only a white background. Do you have a suggestion on how to solve this. Thank you. If it is not helpful you can submit a request to our support team. Thanks Emmet theme team and Motopress team for a great job. Am creating my first website and this is the best theme i have found so far. tried a lot without getting an awesome UI as yours. Am stuck at editing the features part, portfolio and team members. How can i customize these parts? Thank you for your feedback. 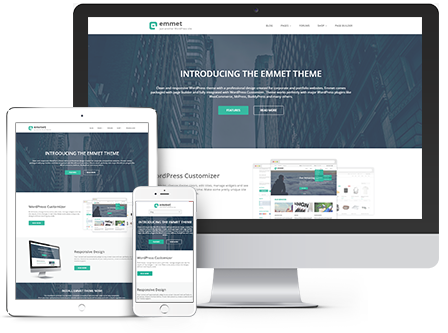 The Front Page of Emmet theme is one of the main features. You should add proper widgets to modify those sections. for example you need to go to Appearance>Customize>Widgets>Features or Team Sections and add Theme-Feature widget for Features Section and Theme-Team widget for Team. As for Portfolio Section so it outputs featured images of Portfolio posts. You need to go to your Dashboard>Portfolio>Add new and add more your own Portfolio posts with featured images. Thank you so much for your support. It is working now. A happy wpbeginner. if you mean sticky menu so you can go to Appearance>Customize>General and disable sticky menu option. You can contact our support team or ask your additional questions at our forum. What type of header options does this theme have? Logo left obviously, does this allow centered logo, or logo left with banner to the right etc etc? Thank you for your question. You can modify header layout by installing Child Theme and editing header.php file. 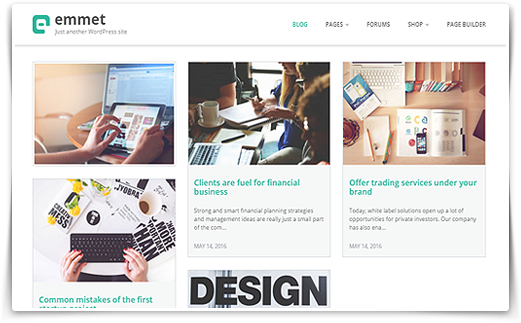 I am running WordPress 4.7.3 running Emmet theme. The “sticky menu” option, when enabled, makes the menu bar jump past the top section of the page when scrolling down, which is jilting to the user experience. After this, the menu bar does stick to the top of the page as expected. When scrolling back up, it again jumps past the top section of the page just before reaching the top. Is this a bug that others have experienced? Are there any easy fixes? I’ve just tested Emmet theme and Sticky menu option and could not replicate the issue you described. Make sure you use latest version of Theme (at this moment it is 1.5.0) and Emmet Theme Engine plugin (1.3.0). If everything is up to date we would ask you to email us screenshots and examples if it is possible. I recently purchased the emmet theme. Just want to ask if you can help me on this matter. I want to use a modal in the customized front page. Can you give me a hint please? It will let you add shortcodes to Text Widget. Thus you will be able to add Text widget to any section and add shortcode of Modal element to it. You can try to translate Front Page using WPML plugin and String Translation module. Make sure you have generated and added Google Maps API key. 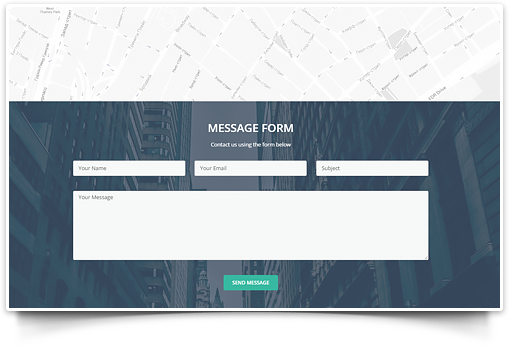 We have just released 1.5.0 version of theme where you can add Contact Form to the Front Page with shortcodes from Contact Form 7 and other form plugin providers. Hi! I am using background video as my header image on the front page. Because of the video in the header the rest of the front page that’s built using widgets disappears when I open the website using Internet Explore or Edge. I have tired OOG, MP4 and WEBM formats but nothing has worked. I’m sorry but I’m not sure I understand where you added the video exactly? Do you mean Big Title Section? Could you describe it more detailed and email us so that we could take a closer look at your certain case? Thank you. In the Big Title Section, I am using video as a background. And the Feature Section that appears on the front page is built using layout builder. Now because of the video background, IE and Edge wont show anything that is in Feature Section. However, when I upload an image instead of a video in the Big Title Section, Feature Section doesn’t show up. Make sure you have added video of all 3 formats (WEBM, MP4, OGG) to play at all browser types. There is a way to clear the contact form after click on submit button? Thank you for your feedback. We’ll keep it in mind for next updates. Have a nice day. 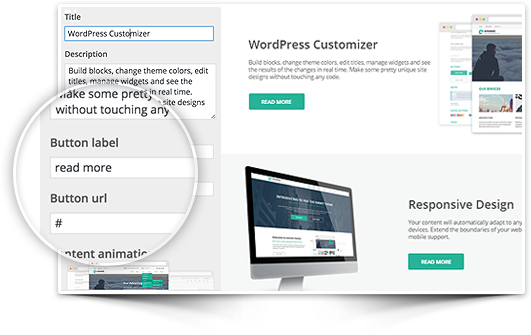 We have released an updated version of theme and engine plugin where you can add custom Contact Forms using shortcodes. Re-posting without links. In the posts and pages you are using H1 tag for site name + H1 for posts name, which makes multiple H1 tags and it is not acceptable. Are you planning to fix this? Also on page I created there is no page title at all, except plain text in breadcrumbs. According to Matt Cutts it is not an issue to use multiple h1 tags if there is logical reason. But we’ll keep your remark in our minds and we’ll change it withing one of the next updates. Currently you can install Child Theme and edit it. Thank you for your help. Ok, I am downloading child theme version. We have released updated version of theme 1.5.0 where we avoided usage of h1 tags. Thank you. Great. I am using Child theme as you suggested, so will keep it as it is for now. But I had another big issue. I just spend half a day trying to figure out why Visual Editor doesn’t start on one page. Even created couple duplicate pages and at last figured out what is triggering problem. It is a word ‘poker’. Visual Editor started when I removed this word from the text. Do you have any filter for such words? No, there is not any word filter enabled in Visual Builder. I would recommend to check the content more carefully. Sometimes the content is copied form MS Word documents with its formatting and it may cause an issue. Try to switch to Text (HTML) Editor and check if there is any weird code at the page. You can email us if you need our assistance. No, it was not a text copy. To test that I created new WP page, switched to Visual Builder, placed Paragraph object, entered one word – “poker”, saved it, then exited VB mode and tried to enter Visual Builder again. It didn’t work. So, I removed last letter and left just “poke”, pressed “Open Visual Builder” button again and it works. You can try it. We tested it locally and it works perfectly. Probably it is cache issue? Could you email us providing access to WordPress? We’d like to take a closer look at it. Yes, you can find group of WordPress widgets at the left toolbar and add Widgets Area. Then select required widgets area and preview the changes. Note: the section should be visible (no hidden) to see it available among widgets areas. Also there is widget “Theme->Recent posts”, but it doesn’t have any options and shows only the list. Latest News Section is not a widget area. If you want to add Posts to a page you can simply find Posts Grid element in Page Builder and add it to the page. You can filter posts by tags, categories, etc. It is rather flexible. thanks. It doesn’t look so nice as yours, but it’s ok.
You are welcome. If you are good in coding you can apply custom templates for Posts Grid element. WP and themes tend to be updated regularly, so I prefer to use custom code as less as possible. Can you answer to another question, regarding H1? That comment is still waiting your approval. You can add custom templates by using function. Thus you can create plugin or install Child Theme not to worry about updates. Does it work with WP 4.7? None of widgets I added (Features, testimonials and etc) don’t show up on front page. I created home page with MotoPress Content Editor, so I am good for now. Thanks. Hi! I want to centralize the “team” members, because my team is a “one man team” (only me) and it keeps going to the left, and i can’t center my profile in the widget area… Any suggestion? Please describe your question and submit to our support team. We’ll find a solution for you. Thanks for the reply, i solved this issue changing the css, thanks anyway! I need put the translated “.pot” file in other place or what i need to do? Hi guys, bought your template and have an unexpected error. Blocks read more and features are not showing, Just installed nothing changed, no errors. In settings flags are OK, but, still nothing showing, could you help me? Probably some file was damaged while theme installation. You can submit a request providing admin login data. We’ll have a closer look at it. Heya how do I add a custom content section to the front page? I would like to be able to custom code this or use the page builder so that we can have a video on the page (not in the header background). You can add video to MotoPress Slider and add it as widget to some of Widget Areas on the Front Page. I’ve added your request about custom content section. We’ll keep it in mind. Thank you. Thanks for your help… Managed to sort this now – didn’t realise I was able to add to the content sections. Can’t seem to find a way to edit the text “The company with over 5 years experience of delivering best consulting services for personal and business needs.” in the footer on the front page. Suggestions? Hi Katie, according technical questions it’s better to contact our support manager https://motopress.zendesk.com/hc/en-us. It’s the quickest way to get help. Thank you! How can I change the position of the content blocks as mentioned above? I know how to hide them or is this only a premium feature? For example, I would like to change the position of the Portfolio section to where the second feature is located. Thanks in advance. When you go to Appearance>Customize and select any section you can see ‘Section Position’ box. Type numbers and change positions of the sections using that option. Emmet is my first theme and I love it, but while testing I came across a problem with features section in Front Page customizer. I don’t know why and what happened but I can’t add icons to the feature section/service section (only images). Can you help me? Currently you can apply images only to Features section. You should upload images of icons. We recommend to use square images to look like on demo website. We appreciate your feedback. There is ‘Section position’ option for each section within Customizer. You can re-order the sections by editing this parameter. If you have more questions you can contact us directly by submitting a request. How do I insert another field in the contact form on the main page ? There is no option to add more fields to Contact Form at the Front Page. If you need more details you can contact our support team by submitting a request or creating topic at our forum. i am not sure why, but the options to expand more Portfolio Posts just eludes me. i know it has to be something simple within the options, but i just cant see it and this is the first time using this style of template. i opened the random files through Dreamweaver title ‘ portfolio ‘ yet it all directs to additional files which i cannot find for some reason. right now the default only shows 8, i would like to show 12 – 16. thank you for your time. Please try to follow the our guide. If it is not helpful you can submit a request to support team. If you use Lite version of the theme you need to get Premium one to contact our support team for assistance. Is it possible to change the logo max-width img to 400px from 250px? Can you please provide the xml demo file? Thanks! Demo file is available here at this page. Please look for Demo Content link. Have a nice day. Hi – this theme is really excellent. Thank you for making it available. I wondered if it would be possible please to have access to the .xml file so I can build content around the demo content please? Thanks. We’ve just added demo content right at this page. Look for Demo Content link. Is there anyway to add more than 12 team members to the team section? Team Section allows to add more than 12 widgets. You can see that here. 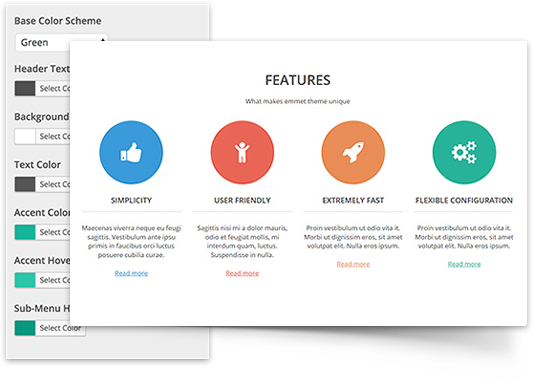 Make sure you use latest version of theme and engine plugin. I see I can add more than 12. The problem is when I do add the third line, it is out of order and not in line. Is there anything you can think of that may be causing that? I have updated to the newest version. As you can see it looks properly on screenshot above. I would recommend to use images of the same size or dimension. You can also submit a request to our support team. They will have a closer look at it. You can add icon to Theme-Feature widget by uploading it as an image currently. It is recommended to use square images. Hi! The Emmet theme + MotoPress page builder looks fantastic. Do you have a demo xml file available for download that matches the demo site ? Thank you for your feedback. Yes, we’ll add .xml file to theme package further. Currently you can submit a request and I’ll attach it for you. Hi , how do I change my contact form ? Is in English, Portuguese I need to put in the fields, already installed puglin but do not know where to change , you can help me? In order to edit placeholders of the contact form at Front Page you should translate Emmet Theme Engine plugin. Make sure it is installed at your WordPress. Hi, is there anyway I can use the front page customizer for inner pages as well? It is impossible to edit other pages with Customizer, but you can use MotoPress Page Builder for editing other page templates easily and visually. Hi, firstly, great theme guys! Secondly, is it possible to add a search on your customisable front page? Could you let us know where exactly you would like to get search box at the Front Page. Thanks for your feedback! Thanks for the reply. I’d like a search next to the menu items, is that possible? Currently it is not possible but I’ve added your request to our feature request list. Thanks for feedback. First of all, thank you for the great work! I am trying to hide the sidebar in a WooCommerce page. However, even when you hide it in the Options, there is still a white space on the right of the page, so that the content doesn’t flow into there. Looks ugly. What do we write in the child theme’s style.css to hide it completely? However, nothing seems to work. Could you please drop me a line here? Thanks in advance? You can refer to this Forum Topic to find a solution. Thank you! Checked that out. If you want to embed custom Contact Form to Customizable Front page you should use widget or shortcode. It depends on the plugin you use. Unfortunately the information you provided does not allow me to provide exact solution. You can submit a request describing all the details of your question. Theme itself is basically looks nice but just “select” element mobile menu is lame in this era. isn’t it better to builtin off canvas menu or option to integrate 3rd party menu plugins? Thank you for your suggestion. We’ll keep it in mind. Currently you can apply custom menus by child theme installation. Hi, I would like to add 10 portfolios, but I get only 8 of them in the front page. Can you help me? I’ve been using the emmet lite theme for awhile in WordPress and I can’t seem to figure out how to change the background color for a page. I wanted to add some color instead of it all being just white. Currently you can modify background color of the pages by editing style. For this you need to create a Child Theme or use form for custom code at MotoPress Settings. Please contact our support team to get more information and leave a detailed feedback. Hi, My menu doesn’t seem to work when viewport is changed. When I tap on the menu in small screen it doesn’t open up. Please help. Please describe your question more detailed and submit it to MotoPress support team. Screenshots are appreciated. Hi. Great theme, i love! How to change the labels of Contact form? I’m brazilian and i need to change to my language. Thank’s! You can translate the Emmet theme Engine plugin to use Contact Form in your language. Thanks for this amazing theme! Its the only theme I’ve come across that gets customization right. Thank you for your positive review. We’re happy you like the theme and will keep working to enhance it for you. Have a nice day. Hi team. I would like to ask if there is a way to change/move the blocks of the theme. I mean, if I want to move the google map widget, lets say before the testimonials etc. Or if I need the contact form 3rd from the beginning but not at the bottom of the page. Thank you. Yes, since 1.4.1 version of Emmet theme you have an ability to set the order of each section at the Customizable Front Page. You can not do that within theme preferences. You can do that by creating a child theme and editing each section file there. Try to remove it an install latest lite version 1.4.0. If it is not helpful submit a request to our tech support. If you face any difficulties with the theme we ask you to submit a request directly to support team instead of posting it here. The Front Page customizer pulls up an error. Therefore I can’t customize the theme. Suggestions? If you have any issues we recommend to submit request to our support team as we can not check your case without testing your WordPress. Thank you for understanding.